Preheat oven to 350°F. Line a 9x13” pan with foil (for easy removal) and spray with cooking spray. In the bowl of an electric mixer fitted with the paddle attachment, cream butter and both sugars. Mix in egg and 1 teaspoon vanilla and mix until smooth. Add dry ingredients and mix until combined. Spread cookie dough in prepared pan. Bake for about 17-19 minutes until it’s no longer shiny. Cool completely before continuing. Mix peanut butter, powdered sugar, and 1 teaspoon vanilla with a hand mixer until smooth. Spread over cooled cookie bars. Place chocolate chips and Crisco or oil in a medium sized bowl. Heat on high heat in the microwave for 30 second increments, stirring between each, until melted and smooth (about 1 1/2-2 minutes). 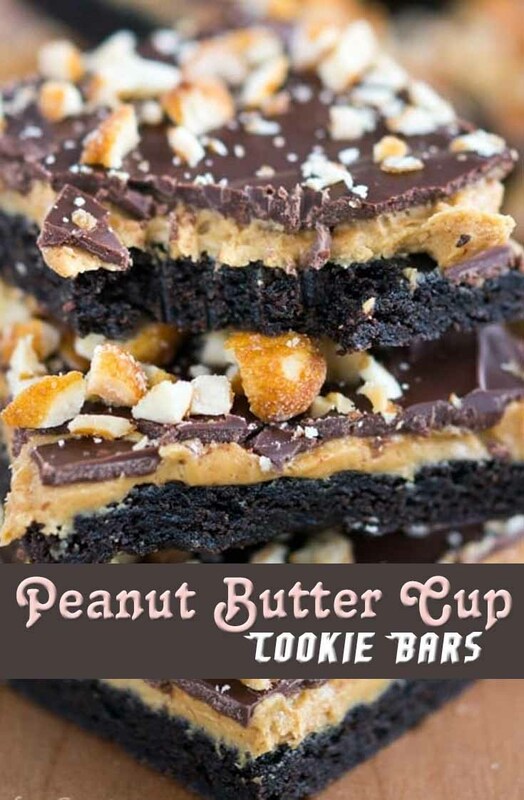 Spread over peanut butter layer. Sprinkle with chopped peanuts. Let harden for several hours. You can chill the bars to make the chocolate harden faster, but be sure to let them come to room temperature before cutting so that the chocolate doesn't splinter when you cut them.